Fantasy Flight Games is proud to announce Dawn of Rebellion, a new sourcebook for the Star Wars™ Roleplaying Game line. 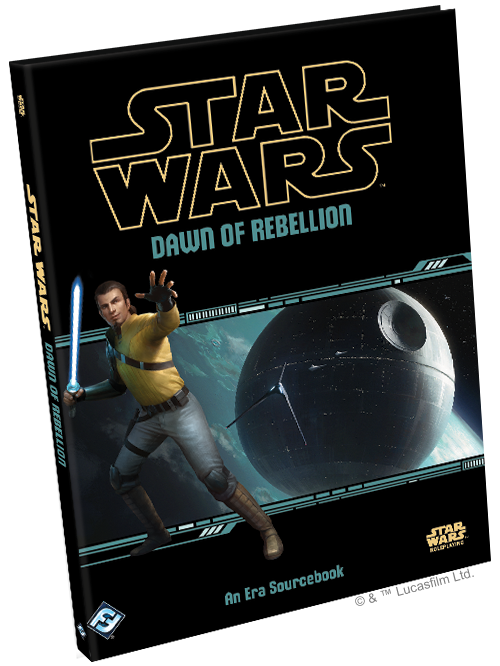 Dawn of Rebellion is the first sourcebook of its kind, designed to be used alongside any of the three core roleplaying lines. Campaigns using Edge of the Empire™, Age of Rebellion™, or Force and Destiny™—or any combination of the same—will find a wealth of valuable information within its 144 pages. Primarily focusing on the years preceding the Battle of Yavin, Dawn of Rebellion features descriptions, context, and statistics for many of the iconic characters and vehicles appearing in the Star Wars: Rebels television show and in Rogue One: A Star Wars Story. The might of the Empire is at an unprecedented peak and a successful rebellion seems like a fever dream to all but the most optimistic. Even those who have no personal stake in the Galactic Civil War feel the tremendous impact of this new order. The bootheels of law enforcement will never completely stamp out scum and villainy, not entirely. Trades both legitimate and illicit are still in high demand in the Outer Rim, where the Empire’s grip is tenuous at best and laughable at worst. Many Hutts and crime lords of all species view the change in leadership in the Core Worlds as simply a market shift; buying, selling, and swindling are all the same game, only the faces on the other side of the table have changed. Opportunities abound for those willing to make some credits outside the law, be it local or Imperial. Bounty hunting crews will always find work from a vengeful mob boss looking to eliminate a threat. Rumors are even spreading that even the Empire itself has contracts available for those able to solve problems with upstart insurgents or singularly stubborn “complications,” though the issue of disintegration is generally not negotiable. Smugglers willing to work the heavily controlled space lanes of the Mid Rim and Core ironically find that the increased presence of militarized patrols can be a great benefit; skilled pilots and smooth talkers that have reputations for dodging customs inspectors and border security see their values skyrocket. In fact, a nascent Rebellion would very likely need to rely on experienced and slightly reckless smugglers to be a secret supply line to various cells and strongholds. The galaxy as described in Dawn of Rebellion is one of oppression and fear. The white armor and unflinching ruthlessness of a squad of stormtroopers are as common a sight as any in most centers of civilization. The scream of a TIE Fighter’s engine can often lay low a heart more completely than its laser cannons. The Tarkin Doctrine — that the fear of force is a more effective means of control than force itself — has proven practical for the Empire but also presents a keen opportunity to those wishing to incite rebellion. Every atrocity committed in the name of supposed order recruits ever more souls into opposition. Eventually, the hate and fear-mongering will reach a tipping point from which Imperial vitality may never recover. For now, though, characters in the Rebellion have a difficult road ahead. Securing military victories against a monolithic foe remains rare enough, but every success is born from a previous one. Powerful political allies need to be won in any way possible, not to mention the everyday necessities of food, materiel, and fighting bodies. The most potent ally of all, though, is the will of the people. A Rebellion is a cruel waste of life if the very galaxy they are fighting for does not believe in their cause. The obligation for struggle must be demonstrated, just as the possibility of ultimate victory must be proven. What the people need is hope. Visions of the Force are clouded in uncertainty. The Jedi Order, a beacon of guidance to the galaxy for millennia, is but a poorly remembered shadow. Essentially all of their expansive records have been purged and destroyed, their traditions all but burned away like the morning fog at sunrise. But while Order 66 could destroy an organization, it could not destroy the Force. And every day, just as every day before, beings are discovering that they can do things — things they can’t explain, things they should not be able to do. For some, this crystallizes in an acknowledgement of the connectedness of all things; for others, it is a pathway to influence and authority otherwise denied to them in a dangerous galaxy. What these characters do with their abilities is up to them. The Jedi are regarded as myth, but perhaps there is truth to the legends of those cunning warriors and wise sages who guided the lost in times of trouble? Perhaps the manifestation of the Force in these individuals can be explained away by a nod to natural intuition or dedicated practice? Whether seeking knowledge, fighting for the helpless, or pursuing personal power, the Emperor’s elite cadre of Inquisitors hungrily prowl for evidence of Force users, before they become a threat to all the Empire has struggled to build. Dawn of Rebellion will equip players and gamemasters with new options, guides, and insights for the Star Wars Roleplaying Game when it releases later this year. In the meantime, stay on alert for more previews for how this exciting new book will expand your games of Star Wars Roleplaying! Look for Dawn of Rebellion (SWR10) to hit stores in Q4 of this year!